Amy Winters first found Krav Maga in 2011, and it changed her life. She became an instructor in 2014 with the drive to share the transformative power of Krav Maga with the world. 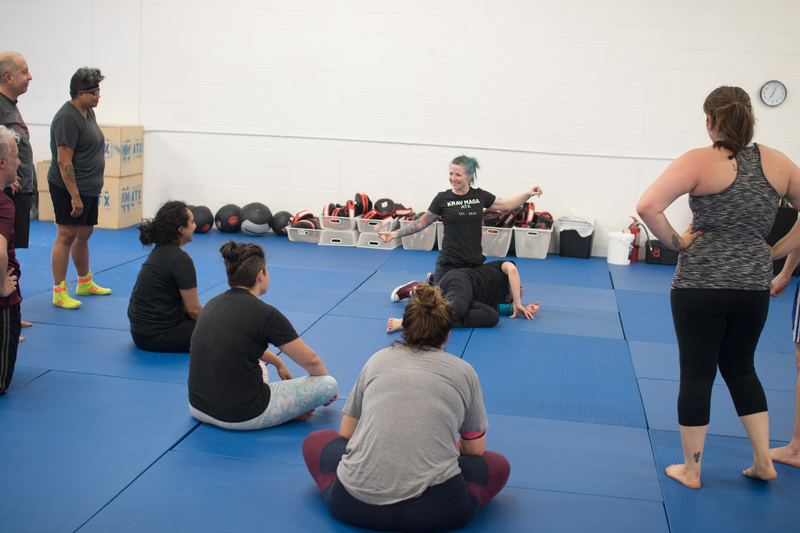 Amy has spearheaded women’s self-defense programs, as well as early morning classes, in an effort to bring training opportunities to as many students as possible. Amy is also a certified yoga instructor who specializes in injury prevention and relief. 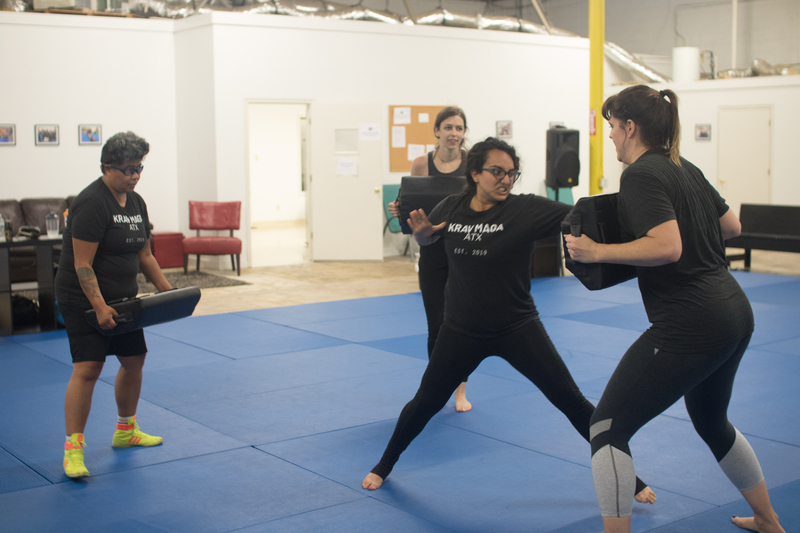 Amy’s students know they can come to her for high-paced self-defense drills, fresh and creative workouts, and a wealth of knowledge about being the smaller person in a fight. Ryan Gillespie is a life-long martial artist. He studied American Kenpo Karate for over 20 years and earned his 3rd degree black belt in 2009. He also has a strong working knowledge of Jiu Jitsu, kickboxing, and wrestling. In 2010, he turned to Krav Maga with a desire to explore something new and has been training in it ever since. He now brings his extensive martial arts experience to teach students of every level, from beginners to his fellow instructors. Ryan’s students know him for his collected and respectful demeanor, his emphasis on sparring, and his deep experience in many forms of combat. She has been a licensed and certified Athletic Trainer since 2012. In 2016, her love of athletics led her to try Krav Maga. A year later, she was leading fitness classes and earning her instructor certification. Brett Smith has been a student of fitness his entire life, as well as being a strong believer in home and self-defense. These two aspects made Krav Maga a natural fit for him. A student since 2017, he has been teaching Krav Maga and fitness classes since 2018. Presently, he continues his pursuit of knowledge with the goal to become an NASM certified personal trainer, an NRA firearms instructor, and Texas License to Carry Instructor. Brett’s students know him for his ever-evolving knowledge of exercise and fitness, his unwavering belief in survival and self-defense, and his strong yet kind spirit. Eva Agaeva started lifting weights in a basement in Russia at 13 years old and never stopped. She began training Krav Maga in 2015, compelled by the system’s real world applications and how classes consistently pushed her past her perceived limits. In 2017, she became a certified instructor and has strived to elevate her students past their own limitations ever since. Krav Maga ATX staff and students alike know Eva for her explosive power, her no-nonsense teaching style, and her drive to draw aggression out of her students. Brad is an Iraq and Afghanistan Army veteran who has served and trained extensively within the US military. He successfully graduate from the following Army Schools: Airborne, Ranger, Jumpmaster, Pathfinder, Instructor, Ground Reconnaissance, Maneuver Captain’s Career Course and the Basic Infantry Officer Leader Course. Brad’s military service led him to an interest in combatives, self-defense, and ultimately, Krav Maga. He became a Krav Maga instructor in 2018, as well as managing external operations for Krav Maga ATX. Brad brings a non-stop, high intensity energy to his fitness and Krav Maga classes – and brings that same energy to seeing Krav Maga ATX achieve its goals. Christa Gary is a passionate high school teacher who came to Krav Maga in 2016 after seeing exciting pictures of her friend training. She spent a life-changing summer attending daily classes, embracing the catharsis and empowerment she found in her training. Two years later, she joined the ranks of her instructors, grateful to share the practice with others. Christa is also a 200-hour certified yoga instructor, and she brings her love of teaching, her encouraging leadership style, and her iron-clad toughness to both mobility and Krav Maga classes alike. Jeff Isacksen came to his first Krav Maga class in 2011, hoping to better learn how to be an ally and protector to his friends and community. In 2014, he became a certified instructor and began sharing the art of defense with others. Jeff’s desire to expand his own training and offer the most knowledge that he can to his students has led him to pursue training in other arts. He currently studies kickboxing, wrestling, and Jiu Jitsu in addition to Krav Maga. Jeff’s students know him for his sharp sense of humor, his emphasis on refining techniques, and his belief in drawing on knowledge from many different arts. Image courtesy of Austin Impact Jeet Kune Do. Kaci Kai began training Krav Maga in 2008 and was immediately taken in by the thrill of the practice. Eventually, her love of Krav Maga led her to pursue additional arts, such as no-gi Jiu Jitsu and kickboxing—including traveling to Thailand to train in Muay Thai. Kaci’s background is in marketing, design, and leadership. She’s worked for industry giants like Whole Foods Market and as an altMBA Coach for Seth Godin. She was also instrumental in marketing, fundraising, and developing the local nonprofit, Austin Creative Reuse. Kaci’s team knows they can count on her for her sound business mind, her incredible work ethic, and her passion for bringing good to the world. Francisco Betancourt began training Krav Maga in 2010 with only a small amount of Muay Thai experience. He loved the no-nonsense approach to self-defense and, as someone with limited mobility, the ease of technical execution of the techniques. 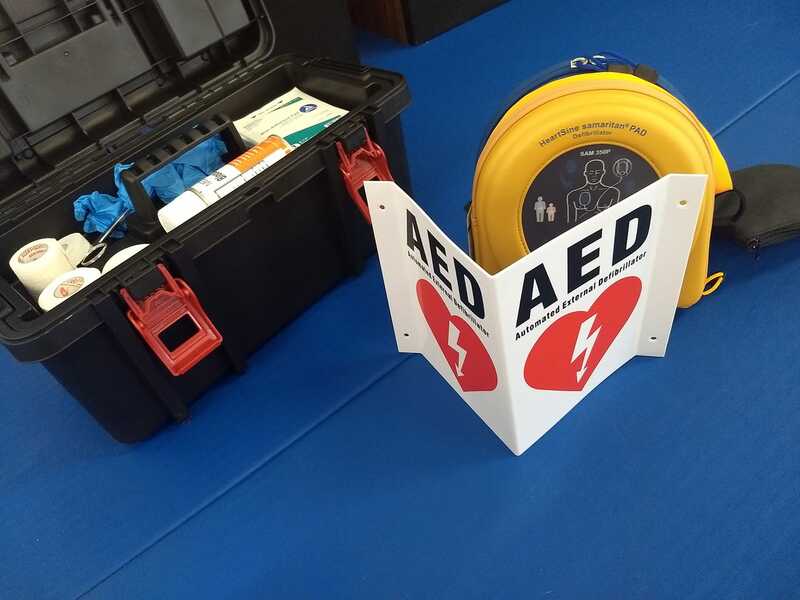 In 2012, he began training to become an instructor. After serving in the Oklahoma National Guard and completing graduate school, Francisco taught Krav Maga full time, continuing to pursue his own advancement. In 2018, he received the rank of black belt through Krav Maga Worldwide. Currently, he lives, trains, and teaches in Lubbock, Texas, where he attends medical school. Among students and instructors alike, Francisco is known for his vast knowledge and skill in the system, his acerbic wit, and his dedication to advancing the training of his fellow instructors. Francisco Betancourt owns and operates Krav Maga Lubbock, alongside fellow badass Briann Stephens.